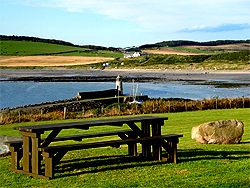 A warm welcome awaits you at Port Logan Caravan Site at Muldaddie in beautiful Dumfries & Galloway. You'll find our site easy to access with your car and outfit - we're at the southernmost end of the village, just a couple of hundred metres up our private road. Situated in a grassy field of about an acre, our generously spaced pitches enjoy uninterrupted, panoramic views across the bay and village. On clear days the hills in Northern Ireland are visible, and at night, the lights of County Down twinkle across the North Channel. The site is a haven of tranquillity with only the sound of the waves breaking below disturb your peace. All pitches have electric hook up (10 amps). We have a stone toilet block with toilet, sink, and recycling facilities. There is a drinking water tap and a chemical disposal point with its own tap adjacent to the toilet block. TV reception is good, but you will probably be tuned into the Northern Ireland transmissions. Mobile phone reception and Wifi access is patchy (see the 'Services' page for details). Port Logan is a great place to visit any time of the year, with a range of places to visit and things to do (see the 'Attractions' page). The beach is just 2 minutes stroll away and there are cliff top and country walks directly from the site. If you stay just for a weekend or for two weeks, we have plenty of suggestions for places to visit and things to do. Alternatively, just bring a good book, and soak up the views without moving from your pitch. The choice is yours. The nearest shop is about 4 miles away in Drummore. There are 3 pubs in Drummore, all serving food. There is also a shop in Sandhead (about 6 miles) and another pub with a restaurant. 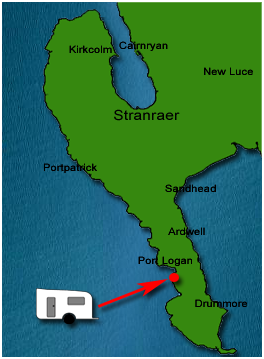 Stranraer is about 13 miles away and has all the facilities and shops you would expect to find in a town. If you want to leave your vehicle, you can make use of the regular bus service that runs from Port Logan to Stranraer or Drummore. If you would like a day trip to Northern Ireland, the ferries leave daily from Cairnryan (about 15 miles). See the "Services" page for more details and links. 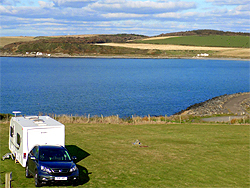 The site is a Caravan and Motorhome Club Certified Location, exclusively for members of the Caravan and Motorhome Club. We are an adults only site, but well behaved pets are very welcome. For safety, we request that dogs remain on a lead at all times whilst they are on the site and on the private road down to the village. If you walk on the adjacent farmland, please respect any crops that are growing, or livestock that are present, and leave all gates as you find them. 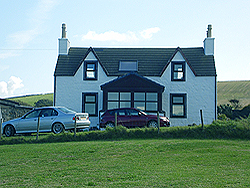 We think Port Logan and Muldaddie Farm are special places and we want everyone to enjoy their stay. 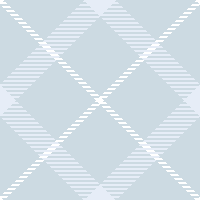 If during your stay, there is something that you think we could do better, or you are in anyway dissatisfied with your pitch or the facilities we offer, please let us know and we will do everything we can to put things right, though unfortunately, the one thing we can't control, is the weather! We've had many guests saying the same nice things about the CL. In particular how the CL appears exactly as it does in the photographs! And no, we haven't 'photoshopped' the sea nearer! If you have already stayed with us and enjoyed the experience, please leave positive feedback on the Caravan and Motorhome Club web site by clicking the button below, and please visit us again soon!